Undertaking a building project but don’t want all the hassle of hiring a skip? We have the solution. Away With It is the company of choice for builders waste removal Abridge residents and businesses trust. We can supply a fast, affordable builders waste removal service in Abridge RM4 and Havering-atte-Bower. Why go to all the effort of loading a skip yourself, applying for a skip permit and wrestling with parking and access restrictions? 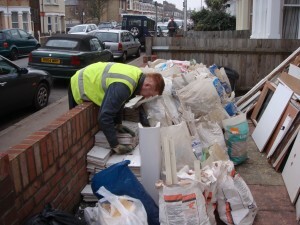 We can provide you with a wait and load service to take all your waste away. We charge according to the amount of space used in our vehicles. That means our services can be much more cost effective than skip hire. We provide a fast and convenient on-demand service with same-day bookings in two hour slots. Plus we are fully licensed and insured for your peace of mind. We work with all sizes of construction companies requiring on-demand builders waste removal Abridge. Our service is also suitable for homeowners undertaking DIY projects such as bathroom and kitchen refurbishments. Give us a call today on 0208 504 7390. Our helpful and friendly team will be happy to recommend the perfect solution for your builders waste removal needs in Abridge RM4. Or you can request a quote online and we’ll get back to you fast.